Email exchange between Vinod Rai and Diana Edulji, who have been at loggerheads on almost all issues facing BCCI, reveals personal slurs & lack of consensus. 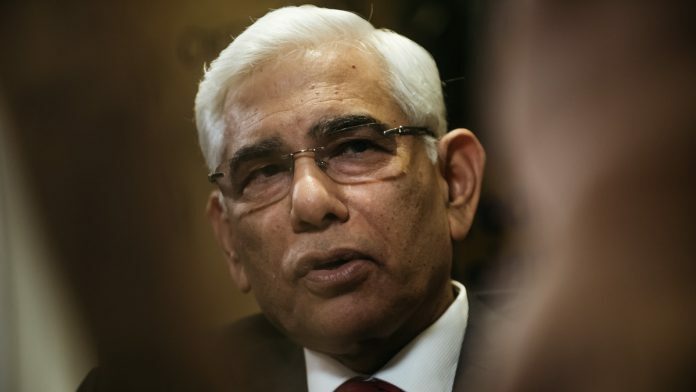 New Delhi: The Supreme Court-appointed Committee of Administrators (CoA), meant to oversee the smooth functioning of the Board of Control for Cricket in India (BCCI), is comprised of just two members — CoA chairman Vinod Rai and his colleague Diana Edulji. That, however, hasn’t stopped the two from squabbling for power, and they have repeatedly failed to reach a consensus. A series of email exchanges between Rai and Edulji pertaining to Hardik Pandya and K.L. Rahul’s controversial remarks on an episode of Koffee with Karan reveals a number of things about the all-powerful two-member administrative panel — the most important being that the CoA appears to be completely split down the middle. In the emails, written between 9 January and 13 January, we learn that chairman Rai believes that Pandya’s apology “has obviously been drafted by the agency”, because it “doesn’t appear sincere”. Rai is “inclined to suggest a penalty,” even though he admits that “I have not seen the clip, maybe Diana would like to suggest some penalty”. “There should be a penalty? What do you feel?” he writes to Edulji at 8.05 pm on 9 January. 12 hours later, at 8:47 am on 10 January, it appears that Rai has finally read the printed transcript of the Koffee with Karan episode. “Very crass,” he writes. “No apology can cover it. “I think we need to give both of them a two-match suspension,” he writes to Edulji and BCCI CEO Rahul Johri, who has been marked on all the mails. Johri is asked to draft an “appropriate instruction”. The next day, Edulji suggests that it is “imperative that the players be put under suspension till further course of action is decided”, making it a point to note that this “was done in the case of CEO when he was sent on leave in the sexual harassment matter”. So far things appear to be moving forward. On 12 January 2019, at 7:24 am, Rai outlines a series of steps that the CoA and BCCI should take. These include commencing an inquiry under the CEO, and completing the investigation by the time the second ODI is over “as we cannot afford to debilitate team strength due to delinquent behaviour on the part of some player”. For this, he suggests the appointment of ad hoc ombudsman, as per legal advice. Edulji opposes every single suggestion. Edulji and Rai also disagreed on whether Pandya and Rahul should be called back home while the inquiry is underway. Rai, who believed that an expedited inquiry is in the best interest of the Indian cricket team so as to maintain its strength, says that he was “not aware of any decision to call the players back”. “I do not remember taking it (the decision),” he writes. Edulji thinks a hastened investigation will “look like a cover-up job being done”, and that keeping the cricketers in Australia during their suspension would only add to the financial burden. To make her case, Edulji cites precedent from 1936, when Lala Amarnath was sent back from the United Kingdom for alleged insubordination. It appears that Edulji, former captain of the Indian women’s cricket team, thinks that Croatia won the FIFA World Cup in 2018 — a final match that was dominated and won by France 4-2 on 15 July, 2018, in Russia. In his reply, Rai made sure to point out Edulji’s mistake. “PS. Incidentally, Croatia did not win the recently concluded World Cup. France was the winner,” he wrote. Edulji’s faux pas not only reveals a lack of general awareness about the sporting world but also draws an equivalence between crass comments made on a talk show and a sportsman refusing to play for his country. Croatia’s forward Nikola Kalinic was sent back from the world cup for refusing to come on as a substitute in the second half in the team’s opening match against Nigeria. Kalinic had claimed that it was due to back pain but was sent home. The correspondence over who won the world cup took place amidst a heated debate about the next steps of the CoA and BCCI to deal with the Pandya controversy — a debate which also included questions about BCCI CEO Rahul Johri’s reputation and character, Rai’s “unilateral decisions” regarding the dismissal of Ramesh Powar as the women’s cricket coach and subsequent appointment of W.V. Raman. At the heart of the Rai-Edulji tussle is the redemption of Johri as BCCI CEO following a string of sexual harassment allegations levelled against him by multiple women. Rai reinstated Johri after an external complaints committee gave him a clean chit. Edulji, however, wanted him to step down. In this set of emails, Rai suggests that the BCCI CEO commence the inquiry into Pandya and Rahul’s questionable statements “as advised by legal”, to which Edulji replies that “in view of the grave sexual allegations levied on the CEO, it wouldn’t be justified if he conducts the inquiry”. In response, Rai states that the orders passed by the Supreme Court require CoA to administer through the CEO, and that the constitution, as also recognised by the SC, requires the CEO to conduct the inquiry. But what starts as a disagreement over procedure and perception, soon becomes personal. Edulji appears compelled to give a fitting reply. At this point, Rai gives up and says that “in the circumstances, please go ahead with your suggestion”. Edulji and Rai were also at loggerheads over the dismissal of Powar as the women’s cricket coach in December last year. Edulji had batted for Powar, arguing that he enjoyed the support of Indian T20 skipper Harmanpreet Kaur and her T20 deputy Smriti Mandhana and that he should continue coaching the team till at least the New Zealand tour. Rai refused to pay heed to her demands and told Johri and GM, Cricket Operations, Saba Karim, to initiate the selection process. “Virat did not accede to Kumble continuing in spite of the CAC (Cricket Advisory Committee) saying so, then why not these two players get what they feel is best for the team,” Edulji had written in an email to Rai at the time, once again citing precedent to make her argument. Even then, Rai did not bend, and said that Kumble merely stepped back as coach after differences with Kohli, and “more importantly, the team did not send emails”. “The team must realise that coaches are not decided on team votes,” he wrote. The one-sided decision did not go down well. “Once again, you have failed to understand that I have an equal say in all matters of BCCI as COA with equal rights not less, not more,” Edulji had written to Rai in December, and till date, like her defeat with Johri, has not forgotten her overruling. In the most recent set of emails, she wrote that Rai’s constant reiteration of staying true to the Supreme Court’s orders falls flat because this is the exact thing she had warned the chairman about “in the matter of Women’s team Head Coach where a committee was appointed in spite of CAC being there and also in the case of sexual harassment matter of Rahul Johri”. “You unilaterally appointed the independent committee which is not as per the Constitution and I had opposed for that also,” she added. Edulji and Rai’s emails also make a pointed effort to hit the other where it hurts. After Raman was appointed by the CAC as the women’s coach, his contract was re-negotiated from Rs 1 crore to Rs1.75 crore for the first year and Rs 2 crore for the second year (based on a performance assessment). Rai, in his capacity as Comptroller and Auditor General of India had calculated a “notional loss” of Rs. 1.76 lakh crore to the national exchequer in the 2G scam — a figure that could not be substantiated and has caused Rai significant embarrassment. The quip could not be lost on Edulji, or on Rai —who eventually got his way. When the two CoA members reached the Supreme Court Thursday, for the appointment of an ombudsman who will decide the quantum of punishment for Pandya and Rahul, they were represented by different lawyers. Pandya and Rahul, meanwhile, still await their fate, and are currently serving an 11-match suspension. Court should be sued for forcing itself into bcci affairs and failing badly to govern it. Why doesn’t Bollywood take Karan to task for his crass show which has affected the career of 2 top cricketers. It may even affect their participation in World Cup. Even Bollywood stars are wary coming in the show which mainly has sleaze, double-meaning and vulgarity spread all over. Time this eyesore of a show taken off the channel.